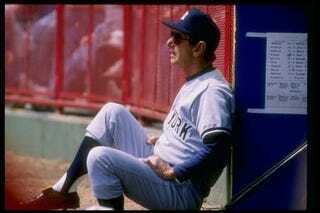 Billy Martin proved what a powerful strategic tool paranoia is. He believed that everyone was against him. And so he spent every waking moment figuring out how imaginary enemies could be defeated in their nefarious plots. And sometimes he not only created strategies to defend against things that would never be done against him. but he realized that those attacks were in themselves novel and he would then try those attacks that he had already dreamed up a defense for. That's why he was so wonderful at suicide bunts and double steals and any way that you could humiliate or psychologically defeat the other team, he was sure that's how the world reacted to him. He was sure the world hated him. And so he turned that really raw, frightened paranoia into wonderful strategic intelligence.